Photo: Water Island (shown behind the two islands in the foreground) would gain a new resort development under a government plan announced last week. (Photo by Brian Major). The U.S. Virgin Islands has entered a lease agreement to facilitate development of a boutique resort on Water Island, a sparsely inhabited two-square-mile island off the coast of the St. Thomas mainland. Virgin Islands Governor John de Jongh last week inked a pact with Stephen Evans-Freke of the Water Island Development Company (WIDC) to facilitate re-development of the former Water Island Hotel property on the island. Earlier this month de Jongh announced plans for the development of an upscale resort development at Port Mandahl in St. Thomas. The hotel planned as part of that project would be St. Thomas’ first newly built resort in more than two decades. WIDCO was selected through a government-driven search launched in September of 2013, de Jongh said. 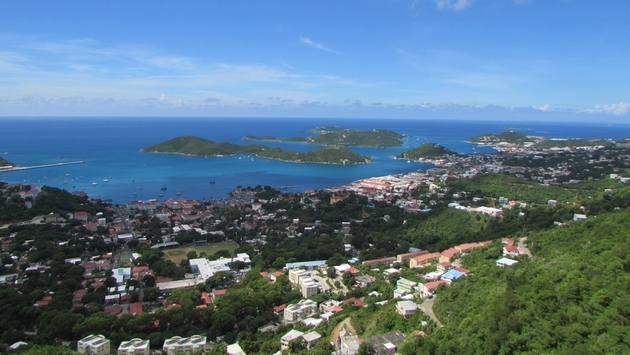 The U.S. Virgin Islands had engaged hospitality advisor and asset management firm REVPAR International in 2012 to assess the viability of a lodging development on Water Island. After the project’s feasibility was confirmed, WIDC was selected from among three firms that submitted proposals to build the development. A Water Island resort “would supplement the product diversification and re-branding that we are executing to broaden our tourism offerings while providing permanent jobs and creating business opportunities,” de Jongh said. The new hotel is planned for the site of the original Water Isle Hotel, built in 1953. That property was supplanted by the Sea Cliff Hotel, which was destroyed in 1989 by Hurricane Hugo. “Since that time, there has been no meaningful and contributing economic activity on Water Island,” said de Jongh. WIDC has proposed building residential dwellings and villas, plus a community center and commissary on Water Island as part of the project. De Jongh “agrees that this will foster economic growth, the government as a general policy only leases land for business and commercial activity and not for residential development,” he said in a statement on his government blog. As a result deJongh is seeking approval from St. Thomas’ Department of Interior “for approval to offer certain parcels for residential development” as part of the project.